Looking to form a counterbalance to the power of the US, Beijing called on Moscow, as one of the emerging market economies, to enter into an alliance with China seeking to increase their leverage in global affairs. 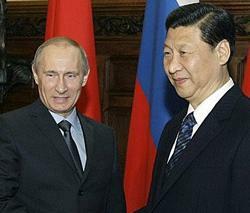 Speaking after talks with Russian Prime Minister Vladimir Putin, Chinese Vice President Xi Jinping hailed the strength of bilateral ties with Russia as a success and went on to express the Beijing government’s support for Russia’s growing power on the global stage. “In our opinion, China and Russia should in the future facilitate the establishment of a multi-polar world and democratization of international relations,” the Chinese official added. The visit by the Russian official comes as Moscow and Beijing seek to put the rivalries of the Cold War behind them and rise as counterweights to the global dominance of the US. Officials from both countries describe their trade and political ties as better than ever before. Beijing considers Taiwan, which became the base for the self-styled Republic of China headed by Chiang Kai-shek when the Chinese Communist forces defeated the Chinese Nationalist Party in 1949, as an indivisible part of its territory and seeks reunification with the island.